Abstract: The MSI 845 Pro2 (model: MS-6528) is a six PCI slot packing socket 478 Pentium 4 solution with 3 DIMM's capable of supporting upto 3GB of PC133 SDRAM. I remember hearing a funny story from one particular video card manufacturer about their decision to go with a particular colour of PCB. As you might have noticed, just about every company has started to pick out their own distinctive shade of colour for the PCB that holds their motherboards or video cards together. In this case, the manufacturer was lamenting over the decision to move to an all red PCB design. The problem was they were concerned with how the workers in the manufacturing plant would deal with looking at red all day long, for weeks or months on end. According to a study they had seen, looking at red PCB for such a long period of time was liable to make some of the workers go insane. Seriously. We have yet to go insane from reviewing red PCB motherboards, so thankfully we can bring you this review of the MSI 845 Pro2 and honestly say that "no reviewers were hurt in the testing of this motherboard." 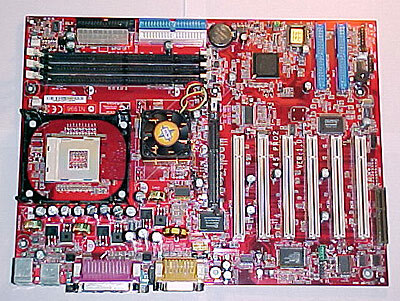 The 845 Pro2 is by all accounts a good motherboard that not a lot of people will be paying much attention to because of the weak allure Pentium 4's and SDRAM give off. It's almost a shame, but with i845D just around the corner it's understandable, at least to the general consumer. Industry and corporate environments have always been behind the times, and it's really for these markets that the i845 chipset is intended, at least that's what we've been told time and again from a half dozen manufacturers. Who would have thought that IT departments would be afraid of moving to DDRAM solutions? The MSI 845 Pro2 (model: MS-6528) is a six PCI slot packing socket 478 Pentium 4 solution with 3 DIMM's capable of supporting upto 3GB of PC133 SDRAM. As with all MSI mainboards, overclocking features are heavily supported. IDE RAID comes compliments of the Promise chipset, and the AGP slot supports up to 1.5V 4X cards. The 845Pro2-R is really destined for the corporate market who need an extremely reliable solution that is equally cost effective. SDRAM gives customers on this plane an inexpensive way to jump on the Pentium 4 bandwagon, and still maintain a semblance of upgradeability. Despite the initial excitement surrounding VIA's P4X266 chipset which enabled the Pentium 4 to work with DDRAM, few if any manufacturers are willing to risk their relationships with Intel to make the boards. SiS may find itself filling the void eventually, but for the moment the i845 is readily available to consumers and therefore the board of choice in some circles. Performance users, and high-end gamers looking for killer systems will side with AMD solutions which offer better price points and performance. 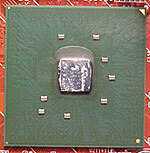 The Intel i845 chipset supports a 400 MHz system bus for the Pentium 4 processor while bridging the gap so that standard PC133 SDRAM memory can be used in place of what used to be an RDRAM only arena. Support for lower cost PC133 SDRAM also extends the P4's reach into value priced systems and large roll-outs into corporate markets. The 400MHz system bus of the i845 solution enables up to 1GB/s of data transfer from the PC133 SDRAM and 3.2GB/s of memory bandwidth to the Socket 478 P4 processor. Other features of the i845 chipset include an 4X AGP interface (3.3V video cards are not supported), 133MB/s to the PCI, support for four USB ports, six-channel audio, a generally unused LAN connect interface, dual ATA-100 controllers and the almost completely pointless CNR (communications and networking riser).